this year I wanted to shift from Castle to Pirates and I took back my whole collection of LEGO Pirates. I mixed with a friend, Captain Sweetness, and we gave birth to a large Pirate Diorama. My friend Giovanna, GioO took the pictures. 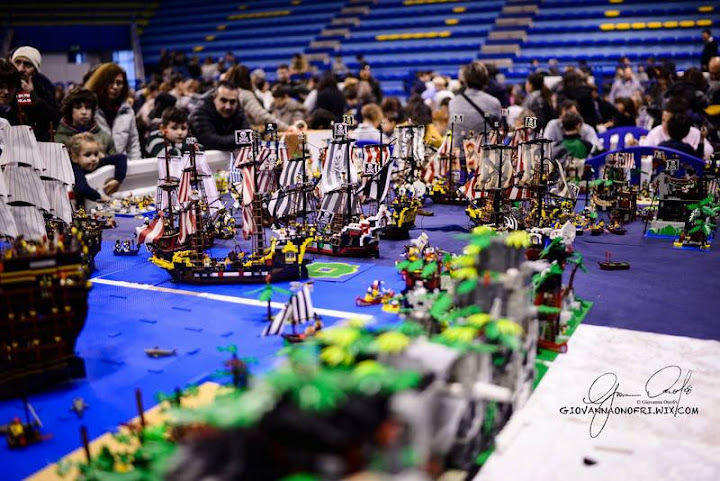 We have large displays like this in the Pirate MOC Forum, because the display usually contains MOCs, and I believe that setting up a display like this of only sets is really one large MOC. There is a lot of great detail in this display. 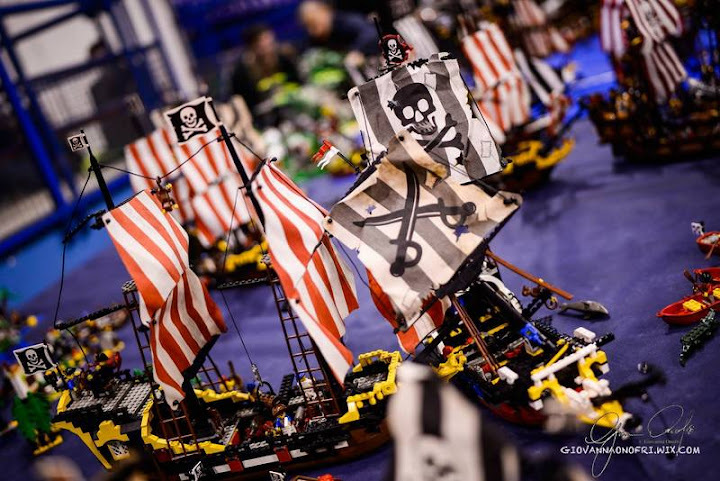 It likely puts the collaborative pirate display I'm working on for Brickworld Chicago 2016 to shame. It looks great, and thanks for sharing. It looks like a bunch of the vessels in the display need their sails restored. I recommend checking out Matthias' tutorial to clean and restore sails. I replaced your over-sized images with down-sized images. You need to post images that meet the Site Guidelines. You typically don't need images larger the 800x600, 1,024 x 768 max. This is a brilliant layout but calling it "large" is an understatement. More like "huge!" The fleet looks great even if some of the ships are official sets; the big one in the first pic is especially beautiful in those colors. 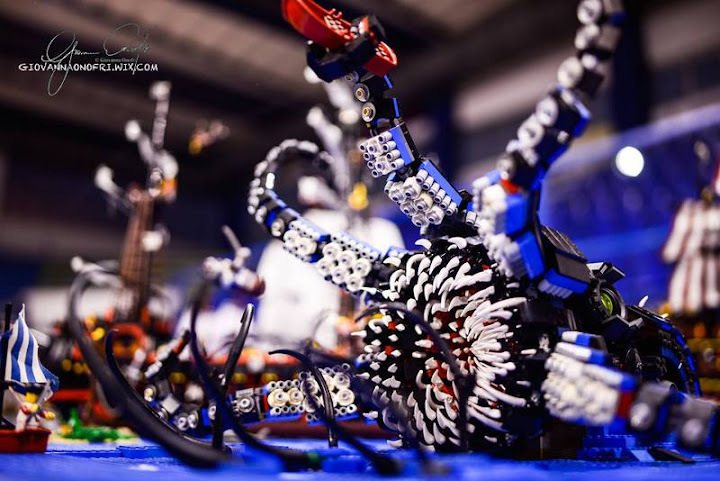 That's the baddest sea monster I've ever seen in Lego. The islander section is perfect - very moody and "dark." Overall this is excellent. I didn't know you were into Pirates. Any chance you'll hang around or are you leaving port? I'd love to see more creations be they yours or collabs. P.S. Whenever I hear "sweetness" I think of Cap'n Jack Sparrow and Angelica. YAARRR!! Thanks and sorry this is the first time I post something like this. However I would add one more thing: this diorama contains all the sets that LEGO has produced for the pirates series through the years but one (6250 which I am still missing). All those sets are illustrated with a small cart on the table edge showing the set's name, year and number. 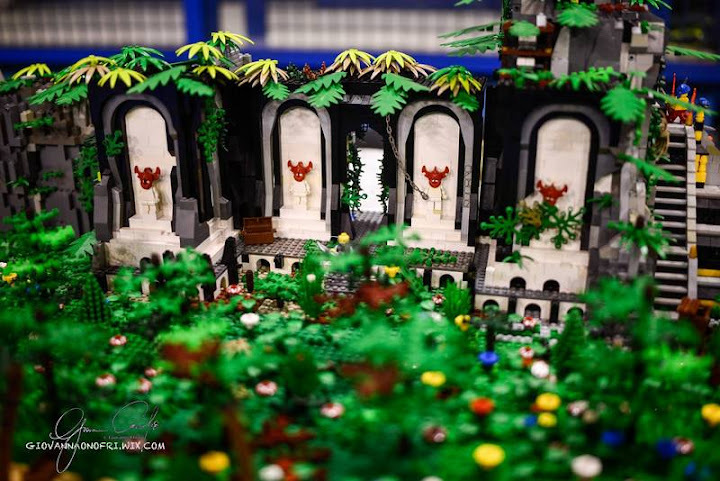 The Diorama MOC is so impressive!!! You guys managed to creat something really awesome for crowds of fans to admire - thanks a lot. I doubt I can fall asleep tonight. Never thought a couple of friends can collect all the pirate sets ever made by LEGO! If you have 5003082 you'll see a nostalgic booklet about them ALL. I hope to get it some day. And I wish you to find 6250 under your Christmas tree!!! Thanks for your reply. Unfortunately Bricklink, e-Bay and Amazon aren't available in Russia. What are your LEGO plans? That sea monster is incredible, as is the entire diorama. Any chance we can get more of the sea monster? 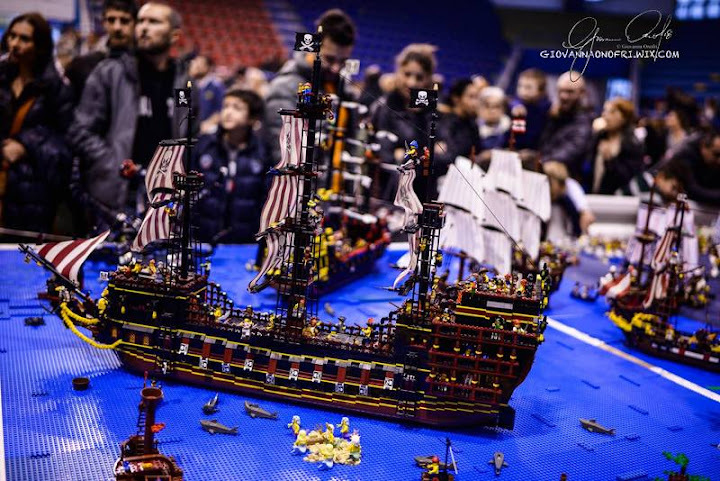 I see many pictures on facebook page: your pirate fleet is incredible huge. Hope to see it exposed again as soon.